Background: 12 Angry Men is a 1957 film, originally a teleplay called ‘Twelve Angry Men’ written by Reginald Rose in 1954. 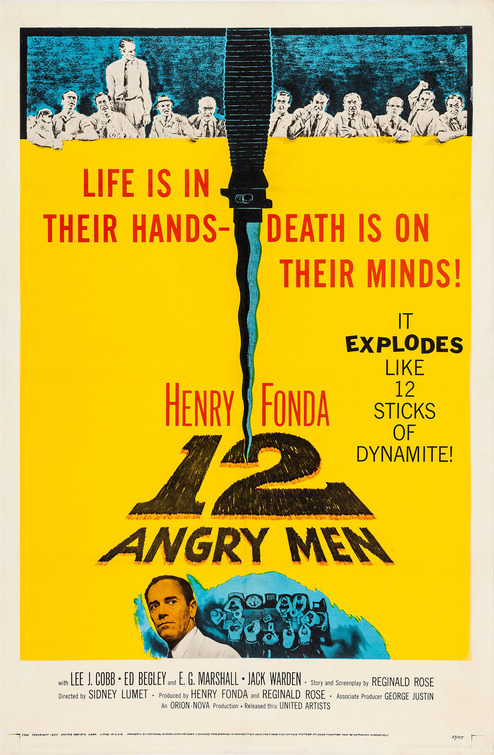 It was then adapted into TV series before becoming a film with its perhaps more ionic title ’12 Angry Men’. The film is exclusively a male cast, with Henry Fonda being the most iconic actor to star, playing Juror 8. The film was directed by Sidney Lumet and is almost entirely shot in one room. The black and white film depicts a court case where a young man has been accused of the murder of his abusive father by stabbing him to death. The young man in question is only shown in one shot depicting a close-up of the concerned boy’s face. Towards the end of the film it is almost entirely filmed in close-ups and low angled shots in order to convey a feeling of intensity and claustrophobia. Baring the start and end of the film, the main bulk of the story is exclusively shot in the Jury room where they debate the various components of the boy’s case. The Jury is simply known by numbers, “Juror 1”, “Juror 2” and so on. It is only in the very last scene where Henry Fonda’s character Davis, and Joseph Sweeney’s character McCardle, introduce themselves to one another with their actual names. As the title suggests, there are 12 Jurors and the men must reach a unanimous ‘guilty’ or ‘not guilty’ verdict. Plot: An initial vote is taken with Henry Fonda’s character, Juror 8, being the only one to say, ‘Not guilty’, and thus the various ethical and moral debates surrounding the boy’s case begin. This proclamation of innocence throws a spanner in the works for some, Juror 7 for example is impatient for a unanimous decision as he has tickets to a Yankee Game. Whilst Juror 10 displays a clear prejudice against those who grew up in the slums, making his opinions quite blatant and offending Juror 5 who grew up in the slums. Juror 8 takes a more ethical approach to the situation, believing there to be a degree of doubt in the case against the boy. Therefore, they must spend as much time as possible analysing all the evidence before deciding the boy’s life, no matter how hot the room is. The first piece of evidence examined is the switchblade which was used to stab the father, the prosecution is claiming the switchblade to be a rare item. This the Jury believes until Juror 8 produces the same knife from this pocket, evidence that the prosecution is manipulating the Jury and thus Juror 8’s action plants the seed of doubt in the men’s minds. A secret ballot is suggested by Juror 8 from which he will abstain, thereby granting anonymity to anyone who wishes to change their vote without fear of being persecuted by the other Jurors. The understanding being that if another ‘not guilty’ emerges they will continue the debate. One such ballot appears and Juror 5 is accused by Juror 3 of sympathising with the boy, to which Juror 9 reveals it was he who changed his mind. Two more threads of doubt are woven into the argument. Firstly, that the sound of a passing train may have interfered with the witness’s ability to hear, who claims he heard the boy saying, “I’m going to kill you”. This phrase is dismissed when one of the Juror’s inadvertently says the phrase to Juror 8. Juror 5 changes his vote. The second thread of doubt is made by Juror 11 who believes that the boy would not have tried to retrieve the switchblade after it had already been wiped of all fingerprints. Jurors 5, 6 and 8 then question the claim made by the defendant that he was able to move to a vantage point in time to see the boy running away after committing the crime. Their argument is strengthened both by the evidence that the defendant has suffered from a stroke, and therefore cannot move with ease, and by Juror 8 mapping out his movements within the time claimed. The Jury asks for a map of the apartment in question and determines that the defendant cannot have travelled the distance he claims in 15 seconds as it takes Juror 8 closer to 45 seconds to complete the distance. Juror 3 is becoming increasingly irate as the discussion deepens, he simply wishes to call the boy guilty and walk away from the case despite the mounting evidence to the contrary. He is accused of being a sadist by Juror 8, to which he replies “I’ll kill you” whilst being restrained by others. Jurors 2 and 6 then change their votes, the tally is now 6-6. Juror 4 remains in the guilty boat arguing the boy’s lack of ability to remember the details of the film he allegedly saw in his alibi which he believes implies the boy’s guilt. He is questioned by Juror 8 who tests Juror 4’s ability to remember further and further back in the week. Juror 4 achieves this to an extent with some difficulty, however, he incorrectly names one film title which Juror 2 also saw. Juror 2 then raises a valid argument, the height difference between the father and son is almost a foot and the father was stabbed at a downward angle. Juror 5, who is familiar with the switchblade, corrects the demonstration. He explains that by the design of the blade, one would never stab another in a downward direction because it would me changing hands which is both cumbersome and wastes time if one is trying to stab someone. A switchblade is designed to flip the blade out quickly and to produce short upward stab movements. Juror 7 now changes his vote to not-guilty in order to move the proceedings along so that he can attend his game. At this point it begins to rain fiercely outside, thus rendering Juror 7’s actions pointless. Juror 12 and 1 now also change their vote with Jurors 3, 4 and 10 the only ones to remain in the guilty boat. At this point, Juror 10 exclaims a condemnation against those born in slums, comparing them to animals who should all be locked away for the safety of the public. The reaction of the Juror’s to this outburst is wonderfully orchestrated, with each member of the jury moving away or turning their backs to Juror 10 one at a time, thus commending his words and isolating the character. Juror 4 is the only one to speak, telling him to keep his mouth shut. The final piece of evidence in question and one which proves to be the winning argument, is that of the witness statement by the woman who lives across the road who claims to have seen the boy killing his father. Juror 4 is of the strong belief that this must settle the argument for the boy’s conviction. The women in the question had gone to bed yet was unable to sleep, she had heard the commotion across the road and had gone to her window to investigate. At this point in the Jury room, Juror 4 removes his glasses to finalise his point, but in doing so reveals two indents on the sides of his nose from his glasses. Juror 9 realises that the woman has the same marks on her nose, and that she must have taken them off for the court to appear more feminine and attractive. Juror 4 admits that when he goes to bed he does not wear his glasses and therefore it is almost a certainty that the woman did the same and therefore would not have been able to see clearly to the adjacent building. Juror 4 finally joins the not guilty side of the argument, leaving Juror 3 by himself. After a moment of scrutiny from all in the room, Juror 3 admits that a recent strain on his relationship to his son has clouded his judgement and that is why he wants to find the boy guilty. The Jury pronounce a not guilty verdict, with the final shot of the film showing each Jury member leaving the court house to return to their own lives. Juror 8 and 9 exchange names and shake hands before they too head in their separate directions. Awards: Nominated for 3 Oscars, 16 wins & 11 nominations. Oscars: 1958 nominated for Best Picture, Best Director, Best Writing, Screenplay Based on Material from Another Medium.